NORTHRIDGE – A 62-year-old Lancaster woman was one of two people killed Saturday in a two-car crash in Northridge that left four other people seriously injured, authorities said. Meredith Smith died at the scene of the crash, which was reported at 2:08 p.m. Saturday, Jan. 26, in the 17500 block of Parthenia Street, according to the Los Angeles Fire Department and the coroner’s office. 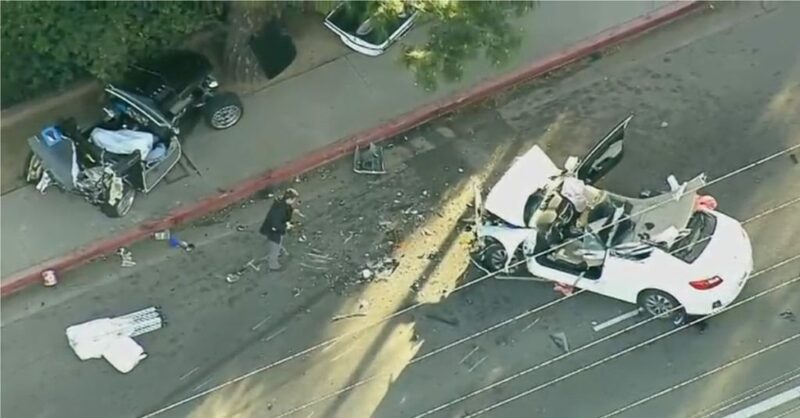 Smith was a passenger in a vehicle, described as a sports coupe, driven by 61-year-old Stephen Hook of the Sherwood Forest neighborhood of Northridge. Hook was taken to a hospital where he died of his injuries shortly after the crash. The other car, described as a white sedan, was occupied by four people. The driver and front passenger were briefly trapped in the wreckage and were taken to a hospital in critical condition, while two rear passengers were hospitalized in serious condition, according to the Fire Department. One of those victims is believed to be as young as 15-years-old, and the others were described as “in their 20s,” according to CBS LA. Details of the crash are still under investigation. View a Fox LA report on the fatal crash below. 20 comments for "Lancaster woman killed in Northridge traffic crash"
Meredith Leslie Smith was a man. He was a fine man and a good soul. RIP Les. I believe the two seat car in question is actually a “Panoz Roadster”. It’s not a “kit car” but was a low number production vehicle. It was completely assembled at a factory by Don Panoz’s company in Georgia. He recently passed away. He was a brilliant entrepreneur and founded numerous pharmaceutical companies and the big win was for the “nicotine patch”. He was very into racing and auto production, also. There were 44 Panoz Roadsters built between 1992 and 1995. There were 176 Panoz AIV (Aluminum Intensive Vehicles) Roadsters built in1996-1997. It’s a Ford V8, 305 HP and 5 speed manual and weighs less than 2600 lbs. That was a fast, fun car then and still is. It’s very collectible because of the low production numbers and yet used ones only command around $40K to $55K. Hook’s midlife crisis antics came to an end. RIP Meredith Smith. … a primitive, obsolete WW I technology, tube frames (e.g., superleggera chassis archetype) were banned from top flight opened-wheel racing, in the early 70s. The only places we see tube frame chassis architecture now is, retrograde or BoP motorsport (e.g., IMSA; NASCAR). This accident, principle reason tube-frames can never be raced against monocoques becomes evident. However, shunting a superleggera into a uni-body vehicle, it’s usually the other way around. Tube frame chassis meets uni-body construction, a tube frame vehicle ordinarily scythes through a monocoque, like a hot knife through butter. That it didn’t, likelihood looms the driver of this kit car had largely scrubbed off significant speed, prior to impact. People in that sedan are lucky to be alive. According to KTLA, it was a “Hot Rod kit car” and not a production Sports coupe. Big difference in passenger safety. True. I was thinking it was one of those Plymouth Prowlers, but it could be a kit car. I’m really wondering about the stated cause of the accident though. From the picture of the wreckage I’d be pretty easy to convince that the sedan, at speed, rear ended the nearly stopped kit car, if it was a kit car. Unless it was “speeding coupe spins one eighty and slides backwards into nose of white sedan” the damage doesn’t match the story. That’s why you should just stay in your lane, Tim. Did either car take evasive measures? Maybe both? Maybe one turned left and the other right or both left or both right just before the collision which caused the vehicles to be in the positions which they were found. With two fatalities, it’s a safe bet the vehicles momentum and inertia caused them to be nowhere near where they started. Depends on what’s in the lane, doesn’t it? And the prospects of smokin’ a dubey, of course. I agree with. Shane about the white car looks like it rear-ended the kit car. The damage to the white car is in the front not the back and the black kit car’s damage is all in the rear-end and you can see no damage to the front or inside the kit car. From crash and where the damage is on each car the white car was traveling fast and rear-ended the kit car which spun it around to face the tree. Either way and how it was caused it is sad that 2 died and 4 others are in critical condition. Say prayers for the injured to heal and the families of all those involved. You “agree with Shane” but say exactly the opposite of what he said. So, it seems that you agree with me, actually, but I understand that for some people around here that would be just too painful to admit. The kit car was traveling at speeds of between 65mph and 70mph. The driver lost control, went into opposite traffic, and slammed head on into white car. The driver of the kit car was completely at fault. Isn’t it the back of the kit car that is smashed? The front is by the tree, right? Tim, there are plenty of other sources about this incident for you to access. The kit car was traveling about 70mph, and lost control, slamming into the white sedan. the white sedan was in the wrong place at the wrong time. Now you don’t have to keep asking questions, when you can get them answered by finding out yourself, right? You’re only reading the A.V. Times, instead of using other news sources that will answer your questions, Tim. Don’t believe me, check it out yourself and come to your own conclusion. Tim is actually a bit correct it seems. Yes, the speeder spun out, but indeed the white car slammed into the back of the, now stopped, speeder, sending them into the fence area. Going off of the sole witness statement printed in the news. That makes sense, though it is really hard to say that someone who runs into a stopped car is completely blameless, even if the stopped car “appeared out of nowhere.” If you, me, or Alexis ever spins a car I hope everyone in the area realizes it and just gets stopped as fast as they can before running into us. Pretty much anyone else too, except Shane, obviously. If he spins a car I hope it winds up under a train.